Far too short. I appreciate the attempt, but it serves as little more than an apéritif. Especially regarding Churchill's pre-WWI life, it proceeds at a breakneck pace. What results is a whir of events and, more egregiously, names that are given little explanation or context. Post-WWI, it gets better. Johnson understandably devotes more attention to the years between the 1910s and 1945. However, this concentration on one period at the sake of another leads to a very unbalanced book. 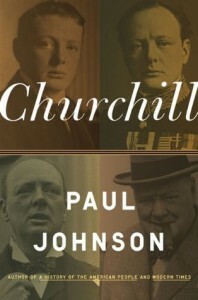 This imbalance was only compounded by Johnson's seeming inability to criticize seriously any of Churchill's decisions. What results is a slim tome more brief hagiography than brief biography, and at times the author's admiration led to him to slip from "breezy historical" to "full-on maudlin" mode. Johnson did his best to analyze the man and his life's work, and in that analysis, I saw a shockingly familiar parallel to Theodore Roosevelt, who I also recently read a book about ([b:Theodore Rex|40923|Theodore Rex|Edmund Morris|https://d202m5krfqbpi5.cloudfront.net/books/1320537179s/40923.jpg|210239] by Edmund Morris). Both men were born to prominent families--the Churchills more political and the Roosevelts more commercial; both were highly ambitious and had political minds; both thirsted for action on the battlefield as young men, but once vested with the power they so craved, were responsible with it and did not try to start military conflicts willynilly, were not the blood-crazed belligerents their detractors expected them to be; both were prolific authors and orators of the highest caliber. I suppose the dictum from the world of physics, that opposite charges attract each other and like ones repel, holds true in the world of human relationships, too, for old Winnie and Teddy apparently did not think too highly of one another. Johnson mentioned in passing that Roosevelt said Churchill was not a gentleman, as evidenced by his decision not to stand when a woman entered the room. A little googling of my own uncovered a letter Teddy Sr. wrote to Teddy Jr. where he called Winston (and his father Randolph) "rather cheap character[s]," that they displayed “levity, lack of sobriety, lack of permanent principle, and an inordinate thirst for that cheap form of admiration which is given to notoriety.” It's no wonder they never invited the other to join them on safari.